Wally Lopez recently premiered ‘Love ‘N’ Music’ at Ultra Music Festival in Miami. Since then, his collaboration with DJ Ron Carroll has become a popular track with many DJs and electronic music lovers. This week saw the release of remix bundle EP featuring mixes from Arjun Vagale, Sascha Sonido, Ismael Rivas, and a new remix by Wally Lopez. 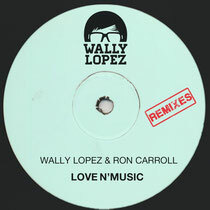 ‘Love ‘N’Music’ is a decent house track with a smooth rhythm and nice soulful vocals and follows Wally’s previous singles, ‘Keep Running The Melody’ feat. Kreesha Turner and ‘You Can’t Stop The Beat’ feat. Jamie. His latest video for ‘You Can’t Stop The Beat’ has already surpassed the 500,000 views on the official VEVO channel, check it out below. Wally recently announced his new weekly residency for the summer season in Ibiza at the Blue Marlin, arguably one of the most exclusive beach-clubs in the island.